Home » News » Do you have a designers eye? 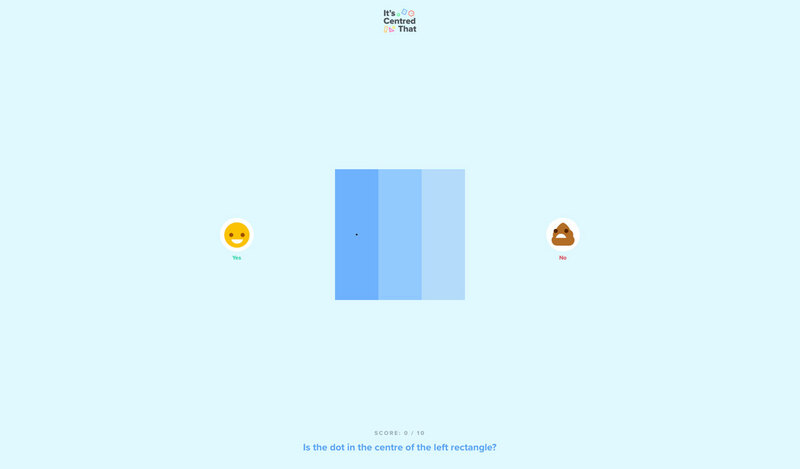 This fun but brutal game will test your designers eye. If you consider yourself a designer with a keen eye for design that can align images without the need for a grid, this game will be sure to challenge you. Test your alignment with this quiz from digital service agency Supremo. Initially built as a playful in-house project, and has since gone on to entertain and frustrate the design community in equal measure. You will go through a series of 10 shapes and select whether the dot is really in the middle of each shape. It’s a fun and frustrating quiz, called ‘It’s Centred That‘. Sound easy? Well, thanks to various shapes and off-putting color combinations, you’ll find that your eyes will be thrown off. While some are clearly way off the mark, others are so devilishly close as to fool even the keenest of eyes. The site is also totally unforgiving of failure: clicking the Yes or No emoji to submit your verdict, a wrong answer equals a total score wipeout and a browser-wide poo splat. While you play this game, you will go through various emotions of amusement, aggravation, and determination to finish the game.